In 1870 a young baker called William Russell Frisbie opened a homemade pie bakery. He found the right premises in Connecticut, USA, close to Yale University, and soon built a reputation for good pies that came in the actual tins they were baked in. Branding was not a big issue in the nineteenth century but your reputation was – so naturally the baker ensured his name was on the tin. 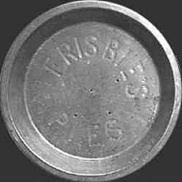 Right thinking of course – as customers that used the tin for baking their own pies would be reminded of the Frisbie Pies to buy more. What the baker never realized was that his name would be directly linked to making recreational history and a future fortune far bigger than the income that he made for his long hours of work. His pie tin was 10" round with a raised edge, wide brim, and six small holes in the bottom, and ‘Frisbie Pies’ stamped on them. Yale students used the tins in a sports game they developed. Because the tins were slightly dangerous when thrown, it became the Yale custom to yell ‘Frisbie’ when throwing the pie tin. Another man, Walter Frederick Morrison was absorbed with the thoughts of aliens arriving in flying saucers. He explored the whole concept of how they could fly. He discovered that a slight curve on a metal saucer would make it fly much further. He shared his idea with the Wham-O-Company and The Pluto Platter was born. When the ‘Flyin’ Saucers’ hit the market, they were manufactured out of plastic. At Yale and Harvard they were still tossing the empty pie pans through the air. The president, Richard Knerr, of Wham-O Company heard about this, visited and distributed the plastic flying saucers to the students as a good marketing story. He discovered that the students referred to his flying saucer gift as Frisbies. Knerr did not know the story behind the Frisbie Baking Company and trademarked the word Frisbee in 1959. The Frisbie Baking Company coincidentally closed its doors in the same month. This story is not unique. There have been many where a different perception has made all the difference. And that is the point. A good entrepreneur must perceive things differently. Ask anyone to define an entrepreneur and they will deliver the answer: A Risk Taker. But entrepreneurs are not risk takers – if anything they diminish risk by outsourcing as much as they can. They certainly perceive risk differently but to them they are opportunity focused. They strive to extract a different kind of value out of what they are presented with. They perceive opportunity in everything and anything. Without the skill of perception – that almost gives you a jump on the future – entrepreneurs would not be the achievers they are. Pie tins would remain just that – pie tins. All around you there is opportunity. Revisit your product and service and develop an alternative perception for it. What would you do with your product if you were a competitor? What would you do with your product if you were in an entirely different industry? If you do not do this, someone else will do so instead and make a fortune out of your product just by applying a different perception. When I was consulting for Pfizer, an inhibitor drug was tested. The side affects were not as expected. The result was Viagra, the drug that stimulated enormous growth for Pfizer. What if they had missed that – and worse – a competitor had done it instead? Whatever your business, make it your very best story by considering all the angles and opportunities. Don’t allow what you have developed or your ideas, to later become another’s ‘once upon a time’ success story. The very raison d’être for entrepreneurship is derived from opportunity. The true meaning of opportunity originates from a time long before modern harbours when a ship had to wait for the full flood tide before it could make it into port. Aware that the cargo in their hold represented the fruit of all their ventures, the whole company aboard ship would be on the look out for the full flood tide that would carry them towards success. Are bound in shallows and in miseries. Entrepreneurship is seeking opportunity; successful entrepreneurship is capturing the value from opportunity; and entrepreneurial thinking is maximising such value. But how can we know what is a good opportunity – one that is right for us and will create both value and reward? Larger businesses are confused when, despite their expensive market research and development, they witness smaller or new competitors create value from what would be a perfect opportunity for them. The way a business perceives opportunity influences what they expect to see from their market research. But the main influence is that the models they rely on relate to monitoring recognised markets. They do not monitor unrecognised markets. Established markets may earn revenue, but it is the emerging markets that will create value. And opportunities are about creating value. it is not about reducing costs or sales incentives. when you add complexity to a simple concept you lose it. it does not happen by itself, it is always captured. it follows our interest and experience. Opportunity asks why and why not? it is not about thinking how and how not. we have to know what it is we want and why we want it. We must never become so preoccupied as to be unaware of it. The whole purpose about entrepreneurship is about seeking new opportunity, capturing it and creating value out of it. When we select whatever it is we are looking for and proactively pursue it we discover that opportunities relating to it actually find us. The very act of being on the look out for opportunity creates opportunity.